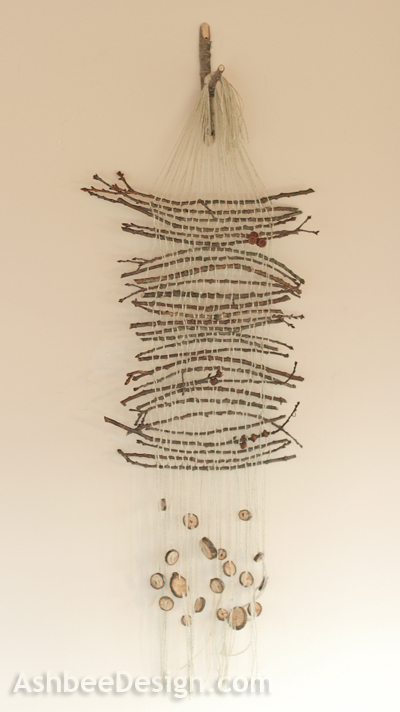 Yesterday, I shared with you the wall hanging I created using a cardboard loom and twigs that littered my yard following Hurricane Sandy. 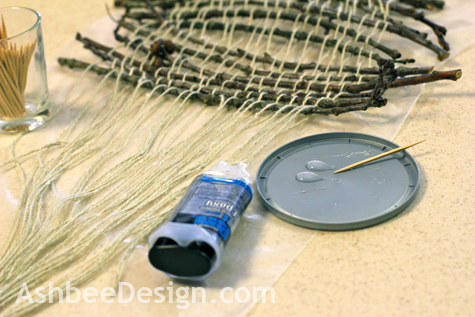 Today, I want to share with you additional photographs and a step-by-step tutorial. 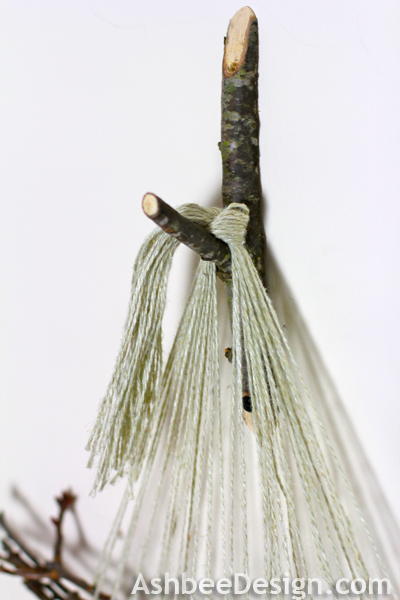 I have made many different types of off-loom weaving projects over the years but this is my first with twigs. I worked on this by the light of a window during the days we had no power following the hurricane. And now it is hanging in the hall outside our bedroom. Twigs: I selected those that were from the tips of branches so each had one snapped end and one end with buds. Large piece of carboard: Size depends on size of final weaving. Mine was about 2.5 x 2.5 feet square. Mine was 3 layers of corrugated cardbaord. Other types work as well. 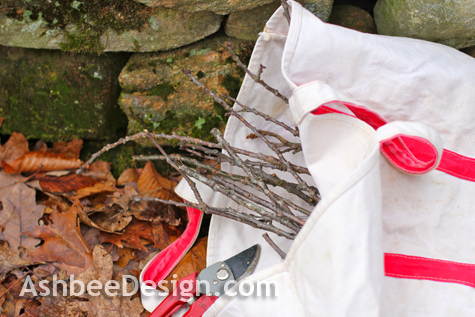 Gather a supply of twigs and small branches. 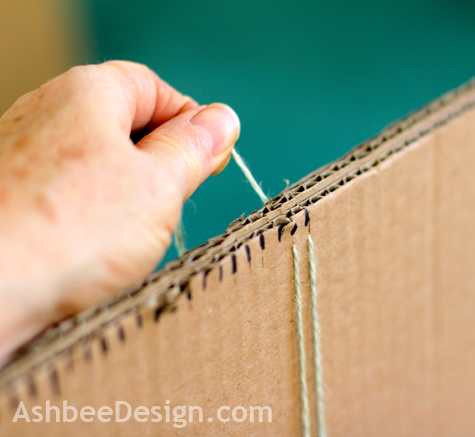 On both the top and bottom edge of your cardboard, use a ruler and make marks every 1/4". For my weaving I made the markers to cover a space 8" wide. 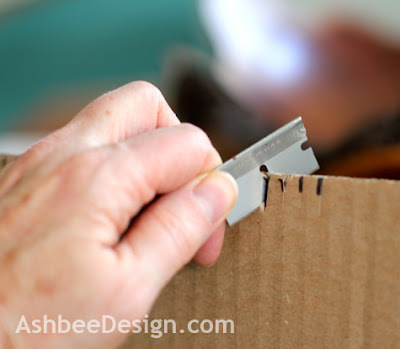 Use a sharp tool and slice down into the cardboard about 1/2" at each marking. 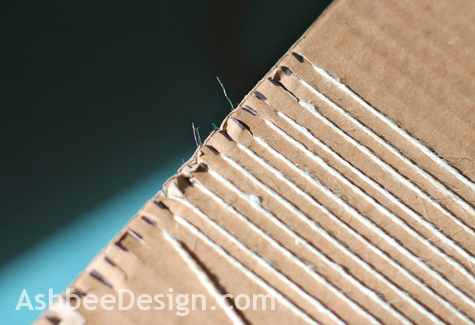 Notice the ridges of the cardboard run vertically. This is important. Take the weaving yarn or string and stretch from top to bottom of the cardboard loom securing it in the slices just cut. Wrap the warp around the back, down to the bottom, through a slot and up to the top into the next slot. Continue wrapping until all slots are filled. 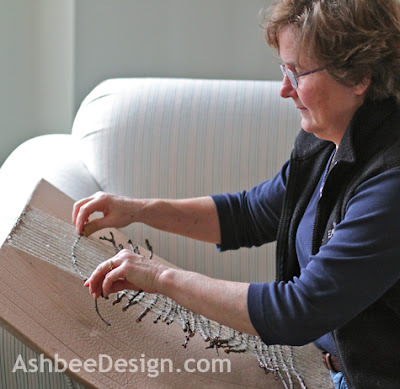 Take a twig and starting at the bottom weave it through the strands of yarn using a classic over one - under one - over one weave pattern. 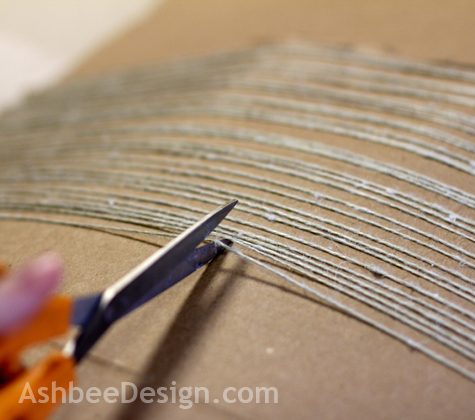 Once it is through all of the warp strings, cut it leaving 1-2" extending from both ends. Take a second twig and weave it through alternating the under over pattern. If you went under a string on the last pass, go over it with this twig. 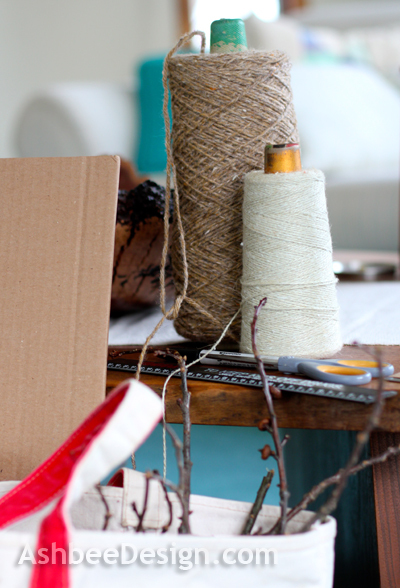 When it is through all the warp strings, cut the end and press it down as close as possible to the first twig. Continue weaving twigs through the warp. Create interesting designs by alternating the curve of a branch occasionally. 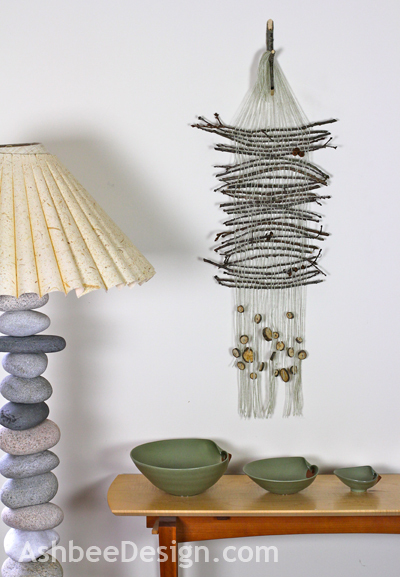 If you have branches with interesting seed pods or twists work those in as well. Because I was using oak branches I had twigs with partially developed acorns on them and I worked carefully in placing those. They were definitely harder to weave through the threads but worth it. Continue weaving twigs until you have reached the desired size, or until there is no more room on the loom. 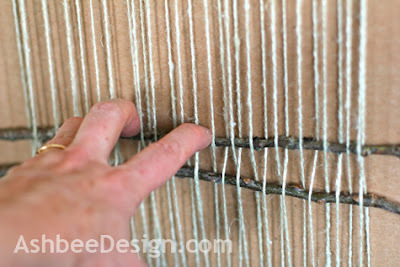 Flip the weaving over and cut the warp strings on the backside right at the middle of the loom. The weaving will be very lose so don't move it around. Let it separate from the loom and lay flat on a work surface. You will have to pry the strings out from the slots on the loom but do so gently so as to not distort the weaving. Mix up a batch of 5 minute epoxy according to package instruction. 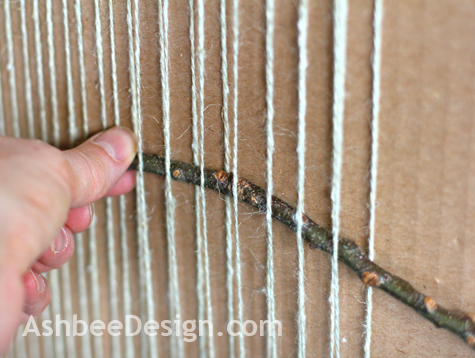 With the back side of the weaving facing up, and using a tooth pick, carefully apply a dab of epoxy between each warp string and the bottom most and top most branches. I repeated this step with the second branch on each end as well. I also repeated it on the side ends of several of the larger branches in the middle of the weaving. This step keeps the weaving from coming apart. 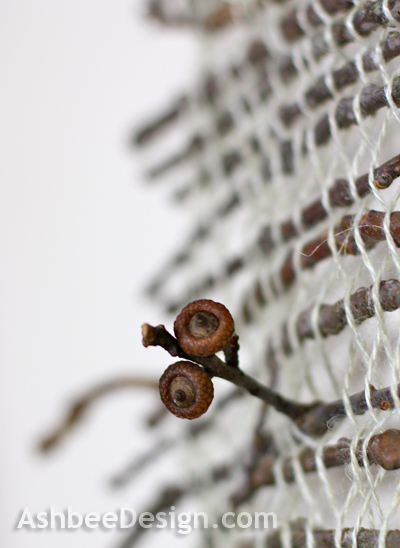 Twigs make a relatively loose weave and you don't want your handy work to come undone. 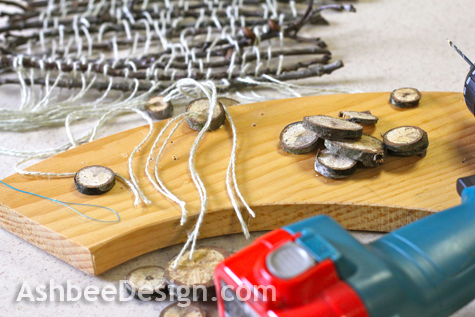 Using branches in 3-4 different diameters, cut little disks of wood. Mine were about 3/4, 1 and 1 1/2" in diameter. This is for embellishing the bottom fringe. 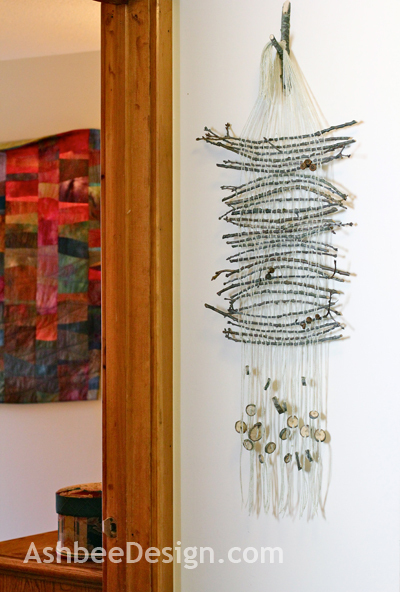 The warp strings hang better if they have some weight attached to them and there are many options - beads, stones, buttons. I chose to make wood disk buttons. 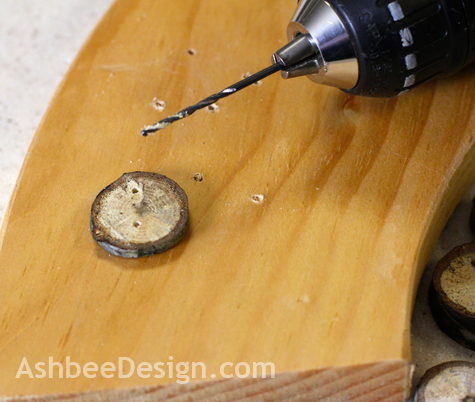 Drill two small holes on each opposite side in each wooden disk. It needs to be large enough to thread two warp strings through. Using a dental floss threader, thread the bottom strings through the wood slice holes. I put two threads through each hole. I threaded in one and out the other on each wood slice. The two holes allowed the beads to hang straight. My holes were tight enough that I didn't need to knot the string. 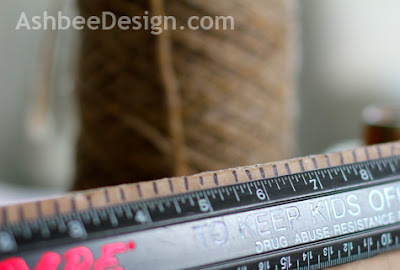 You might need to if your warp yarn isn't textured. Adjust the wood slices to different heights. Some might have two disks. 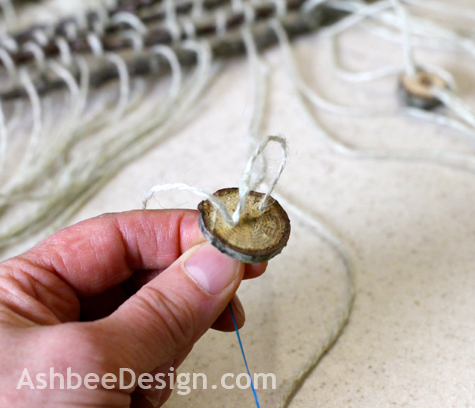 Use an Y branch joint to craft a branch hook for hanging the wall hanging. Knot the top warp strings together to fit over the hook. And find a perfect place to hang it! 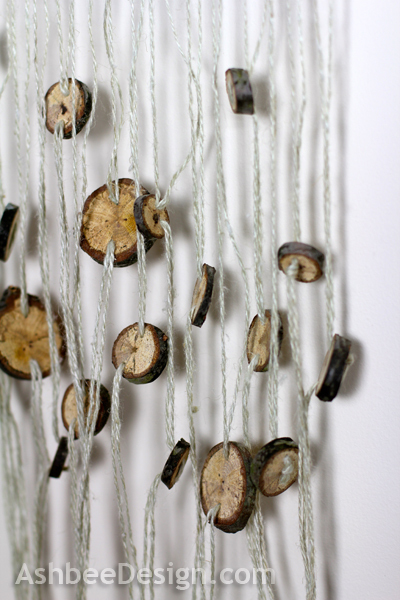 If I ever dared to create a piece like this I think I'd add some chimes to it and make a Natural Wind Chime. So lovely, indeed. Glad you're Safe and in Comfort! Give it a try. This type of project is wonderful because there is no right way or wrong way and the free form of nature keeps you from worrying about precision. Send a photo once done. How wonderful to create something so beautiful from the broken pieces of nature. Terrific tutorial as always. Thanks Merry. My tutorials bring out the (former) teacher in me. This is beautiful and how amazing that you worked on it during your power outage with materials from the storm. A memory you won't forget:)If you have a sec, I would love for you to share at Get Schooled Saturday at Too Much Time On My Hands. Thanks Kim. I was lucky in this storm compared to so many. But it will be memorable for years to come.